Tour in Egypt 5 years - 2002,2003, 2004, 2005, 2006 and Ethiopia in 2013. To Sister Merira and Baba Kwesi: There are no words that can adequately express all that you have done for us! This is only the beginning. Ramessu Meriamen Traveled with the Kemet Nu Tour in Egypt 9 years (2002, 2004, 2005, 2006,2007,2008, 2009, 2010, 2016 and 2017) and in Ethiopia 2 years. appreciated. 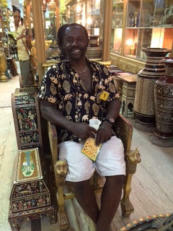 E. Majette traveled with Kemet Nu Tour in Egypt in 2016. Brother and Sister Kwesi, It is so true words can’t express my gratitude of the AMAZING trip of a lifetime, Kemet Nu Tour Egypt. Thank you both for the lectures and your dedication in the study of our ancestral history. My brother and sister, Truly Great Mentors are hard to find, difficult to part with and impossible to fortet. I thnk you both for your part in my Journey. K. Ibrahim (Montu) traveled with the Kemet Nu Tour in 2017. He is shown demonstrating the Montu Arts to group at Medinet Habu Temple. 2006 and Ethiopia in 2013.
traveled with Kemet Nu Tour in Egypt in 2016.